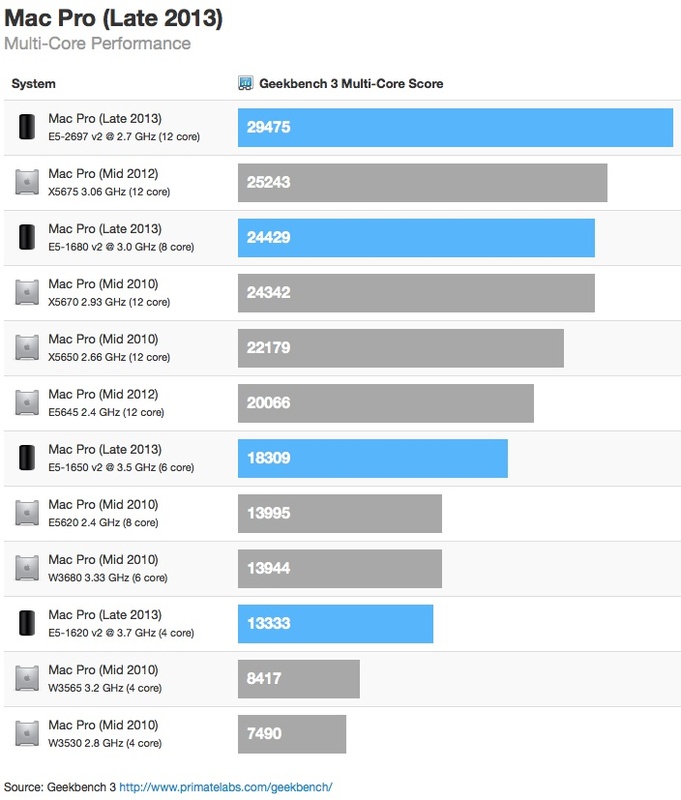 Yesterday, we noted that a 6-core version of Apple's upcoming Mac Pro had shown up in the results database of popular benchmarking tool Geekbench, the third variety of the machine to appear there since June. We compared performance of that machine to an 8-core version from late September but noted that a 12-core version from June was tested using an older version of Geekbench with a different baseline, making direct comparisons with that machine difficult. John Poole of Primate Labs, the company behind Geekbench, has now put together a good overview of what users should expect for the new Mac Pro when it comes to processor options and performance. With Geekbench being a cross-platform tool, Poole has taken several results from Windows machines running the processors that will be offered in the Mac Pro to develop an estimate of performance of the various Mac Pro models. As we noted in yesterday's report, the 6-core and 8-core versions showed nearly identical Geekbench scores for single-core tests, and Poole highlights how that will be expected to hold true for the as yet unseen quad-core model due to consistent Turbo Boost frequencies of 3.9 GHz. The 12-core version will, however, score approximately 15% lower on single-core tests due to its slower 3.5 GHz Turbo Boost. These estimates suggest that single-core performance will be similar for the 4-, 6-, and 8-core models. Since all of the processors have the same Turbo Boost frequency, and since the processors run single-core tasks at the Turbo Boost frequency, this isn't surprising news. However, it is welcome news since users will not have to sacrifice single-core performance when choosing between the 4-core and the 6- or 8-core models. Where the 12-core version unsurprisingly shines is in multi-core situations, showing roughly 20% improvement over the previous high-end 12-core model and scores approaching 30,000. Other processor options also compare favorably to their corresponding models from the previous generation of Mac Pro. CPU capability is of course only one part of the overall system performance, and the new Mac Pro will also offer significantly improved graphics performance in the form of standard dual AMD FirePro GPUs. In addition to the systems being able to drive up to three 4K displays simultaneously, Apple clearly expects developers of high-end software to embrace OpenCL to allow Mac Pro users to tap into that vast GPU power for general computational tasks. 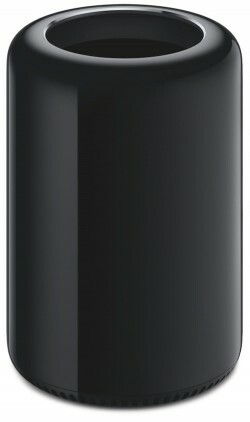 Apple's new Mac Pro is launching in December, and the company has so far only released pricing on base configurations of the quad-core ($2999) and 6-core ($3999) models. Customized configurations boosting to the available 8-core or 12-core CPU and the high-end D700 GPU, as well as other options such as RAM and flash storage, will push prices much higher for customers interested in maximum performance. Meh.... The hackint0sh is sounding more and more appealing every day. Better performance, upgradability, and expandability. Maybe for a personal machine. But, as a Hackintosh owner, I can tell you its definitely not worth the headache unless it's a hobby-machine for you. It's fun to get everything together, and build it. But when you just can't get the installer to boot no matter what, or bluetooth just randomly doesn't work sometimes ... it can be infuriating. Also, a Hackintosh has NEVER been a replacement for the Mac Pro. If you need that type of power (ECC memory, Xeon processors, dual socket), (1) a hack job won't cut it, the time isn't worth it, and (2) there aren't really many (ANY) stable dual socket builds anyways. A hackintosh is more of a replacement for a headless iMac, into which you can put as many cards and drives as you want. If you build a hackintosh with same spec as Mac pro .. it will cost almost same or even more (if you add legal softwares). I find it annoying how people see these numbers and get instantly dismayed... cpu is but one factor. Also, these are estimates based on pc machines only running the same processor. Maybe wait and see actual scores when the actual machines are tested. LOL. Wrong on ALL counts.